The Chief Minister of Goa, Manohar Parrikar who was seeking treatment of his advanced pancreatic cancer, has passed away last night on 17th March 2019. As the former defence minister died, social media started condoling his death. 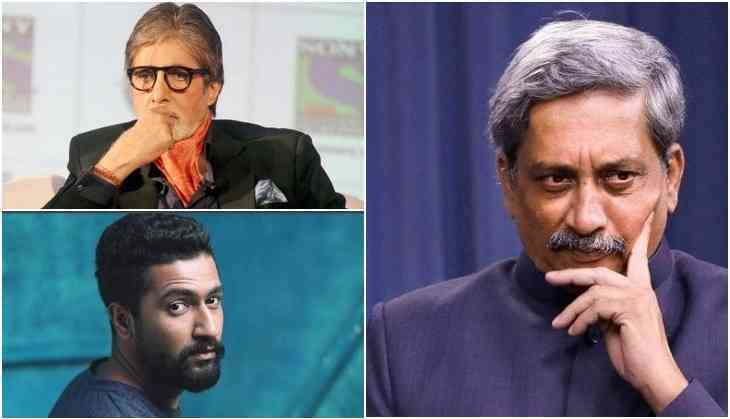 Bollywood celebrities like Lata Mangeshkar, Sanjay Dutt, Amitabh Bachchan, Akshay Kumar, Vicky Kaushal, and others started posting condolences on social media. Even the millennium actor Amitabh Bachchan tweeted, "Manohar Parikar CM Goa, passes away .. a gentleman to the core, simple in demeanour and well respected .. spent few short moments with him .. very dignified .. fought his illness bravely .. prayers and condolences"
Vicky Kaushal who was seen playing a leading role in Uri - The Surgical Strike tweeted, "Saddened by the news of Manohar Parrikar ji’s demise. May his soul rest in peace"
Let us tell you that Manohar Parrikar was one of the most popular leaders of the country and he was quite known for his simplicity even after the CM of the state. As a defence minister also he supervised the Uri - Surgical Strike.